Most people have the basics. 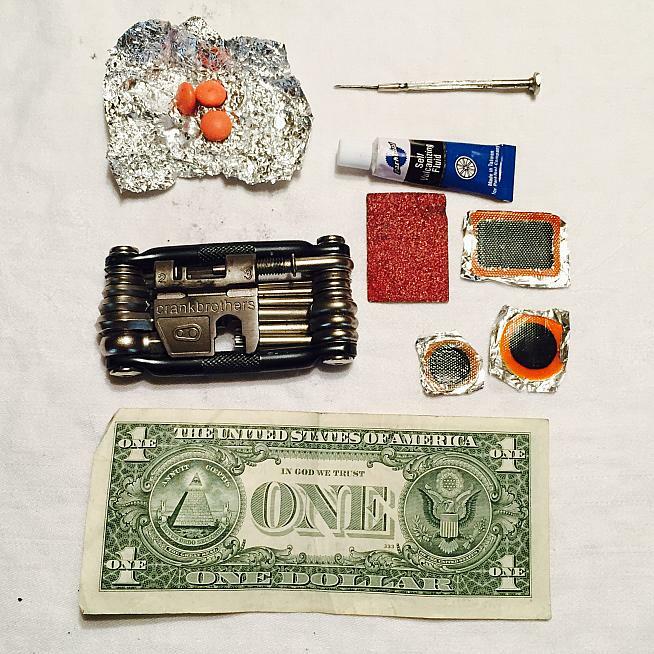 A phone, a multi tool, some cash, a bit of food, a tube and a cartridge. Some riders seem to lug half the contents of their garage about with them in bulky cordora pouches dangling inelegantly from their saddles. But what if you want to be prepared for anything but don't want to to carry the extra weight. Earlier on this year in preparation for a long road race I stripped down my emergency gear to the essentials: tube, cartridge, phone, tire lever, mini pump, multi tool. Ever had a puncture, fixed it and then got another just moments later? The reason could be that you have a sharp object embedded deep in your tire. Most of the time they can be teased out - but what if it can't? Carry this teeny tiny screwdriver and you can get even the most stubborn shards of glass, stone or metal out of a tire tread. Before the era of co2 cartridges and spare tubes all anyone ever carried was a patch kit. These days it's surprising how few people know how to repair a tube on the fly. My kit is in a tiny ziploc bag and has a new tube of vulcanizing solution (that stuff goes bad real fast), a square of sand paper, and a selection of patches. You need a pump as well but I'm assuming you've got one of those. Everyone knows about carrying some plastic and some cash with you on a ride in case of emergency. But why specifically carry some singles too? The reason - to make a 'boot'. If your tire wall blows you can use a folded single dollar bill as a patch to get you home. I've never tried it but apparently it works. Nothing brings a ride to a halt like a snapped chain but it need not spell total disaster. Lots of multi tools don't come with a chain tool. Mine does. Two ibuprophen wrapped up in tin foil. If bad stuff happens these might take the edge off.